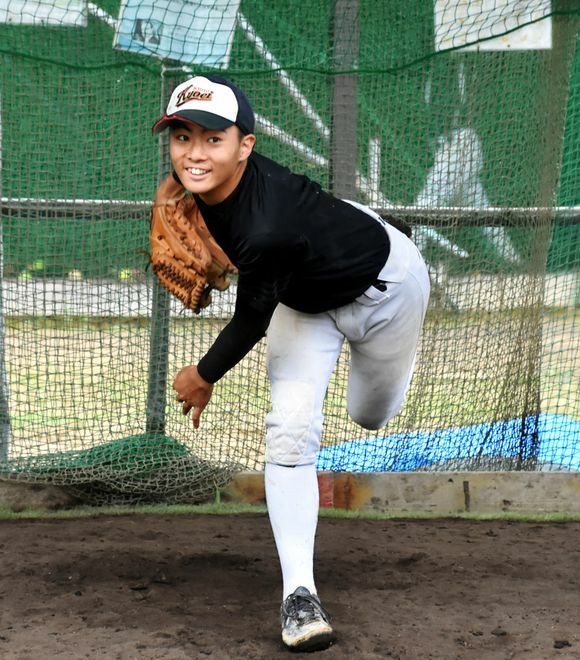 （July 30, 2018 –－　The Asahi）　FUKUCHIYAMA, Kyoto Prefecture--Keita Miki was living his dream when his team competed in qualifying for the 100th annual National High School Baseball Championship, which will start at Hanshin Koshien Stadium from Aug. 5. But the 15-year-old first had to overcome the nightmarish experience of suffering severe burns over much of his body five years ago from a deadly fire at a fireworks festival here. The southpaw pitches for Kyoto Kyoei, a combined junior high and high school, which fought its way through the second and third rounds of preliminary qualifiers held in mid-July. Even though Keita sat out the bench during the qualifying games, he pitched in five games in June. Toshihiko Kamimae, 62, team manager, is still pinning his team's future hopes on Keita, a first-year student in high school. Keita was caught up in the horrendous explosion that occurred during a fireworks festival on a riverbed in Fukuchiyama on Aug. 15, 2013, when he was a fifth-grader. Keita started playing baseball when he was a first-grader and was injured in the accident around the time when he started pitching for a local community baseball team. On that evening, the energetic youngster, then 10, was waiting excitedly on the riverbed with his family for the annual fireworks show to start. He heard a fizzing sound behind him, which indicated something was leaking. As soon as he turned around, the noise of an explosion boomed out around 10 meters from him. A vendor at the site opened the cap of a fuel container to refill an electric generator. The fuel was highly pressurized due to the exposure to sunlight and exhaust heat surrounding devices. As soon as the container was opened, the liquid sprayed over a wide area packed with spectators and was ignited by the flame from a cooking fire, according to police. The boy tried to escape the inferno amid the screams of others. His T-shirt melted in the hellish heat and his arms turned brown after being severely burned. Keita suffered serious burns over almost 40 percent of his body and was put into an intensive care unit of a hospital. He underwent skin grafts and would scream from the pain. The boy who was supposed to be dashing about on the playing field could not even eat due to his aches and fever. Keita was devastated by his misfortune. “Why do I need to go through such a painful experience?” he wondered. Doctors and nurses also held a make-believe baseball game with a makeshift bat and ball. 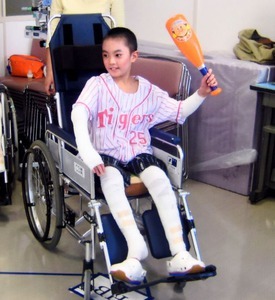 Keita became eager to play baseball again in response to their encouragement. He started rehabilitation including stretching his joints and practicing walking while holding onto the railing. Finally, he was able to resume baseball practice the next summer when he was in the sixth grade. The sports-loving boy was delighted just to be able to play baseball again.